Megan is shocked by all the errors she’s seeing on scholarship and college applications! To help you avoid these mistakes, she’s compiled all her advice into this one quick podcast episode. 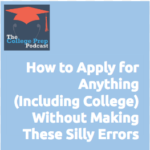 Tune in to discover what these errors are and how to avoid them — so that you get into the college, scholarship program, or job of your dreams. How to fix or avoid these errors when you make them.